Honda's range of sports bikes is well deserving of its reputation. The Japanese manufacturer's CBR line-up has something for every rider, from the entry-level CBR125, positioned as "the ideal first sportsbike", through to the Honda CBR1000RR Fireblade, a motorbike built to deliver outstanding performance whether you're on the road or the track. 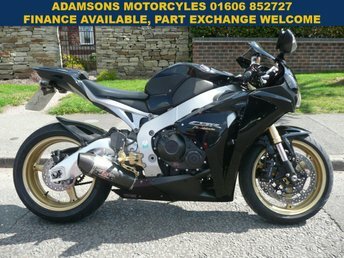 You'll find great deals on used Honda CBR motorbikes for sale in Northwich right here at Adamsons Cars Limited. We're a leading supplier of quality second-hand Honda machines, all of which are competitively priced and come fully inspected. Why not browse our latest range of used bikes here on the website before contacting a member of the showroom team with any questions and to arrange a test ride.